Click here for Silk Gallery. Need to pay for a silk scarf or custom order? Use the orange button to check out. Uzushio means "whirlpool" in Japanese. Silk painter Susan Sieber lived for a year in Naruto, Japan, near the famous Naruto Uzushio - the Naruto whirlpools formed with the changing of the tides - and was inspired by that force of nature, and also by the beautiful forested, hilly countryside around the town. Japanese design elements and images often show up in her work. 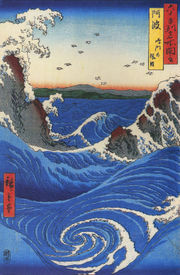 The prefecture she lived in, Tokushima, is famous for its indigo dying and silk shibori (fold-dye) techniques. Love the scarves? Want to wear those fabulous colors all year round? Then check out a sneak preview of Uzushio Silks new rayon and cotton handpainted tops Here! Keep your handpainted wearables beautiful by using care in washing them. Washing one of these items incorrectly, such as wringing them dry, using harsh detergents, or dry cleaning them, can destroy a handpainted item. 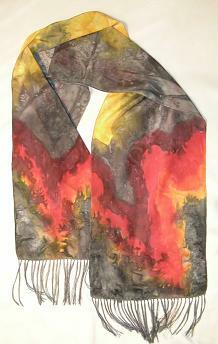 Handpainted clothing should be handwashed inside out in cold water and hung or laid flat to dry. You can use a mild soap or baby shampoo for your handpainted items. Some items made with cotton or stronger synthetic fibers can use stronger soap. Give your handpainted items good care so you can enjoy them for years to come!